Renewable Energy - Servicio Técnico Oficial Daikin Málaga. Acontermica. Solar energy is the energy obtained by capturing the light and heat emitted by the sun. It is a non-polluting renewable energy, also known as clean energy. The acquisition of this energy is direct and easy to maintain therefore the costs are quite low. The only major cost to the user is the installation, which ends up paying for itself in the long run with all the money saved. Because of this, it is quite common to see solar panels in most homes. Due to the sunny, light climate on The Sun Coast (Costa del Sol) it is quite normal to find solar systems in Malaga, Torremolinos, Benalmadena, Fuengirola, Mijas, Marbella, Estepona, etc. 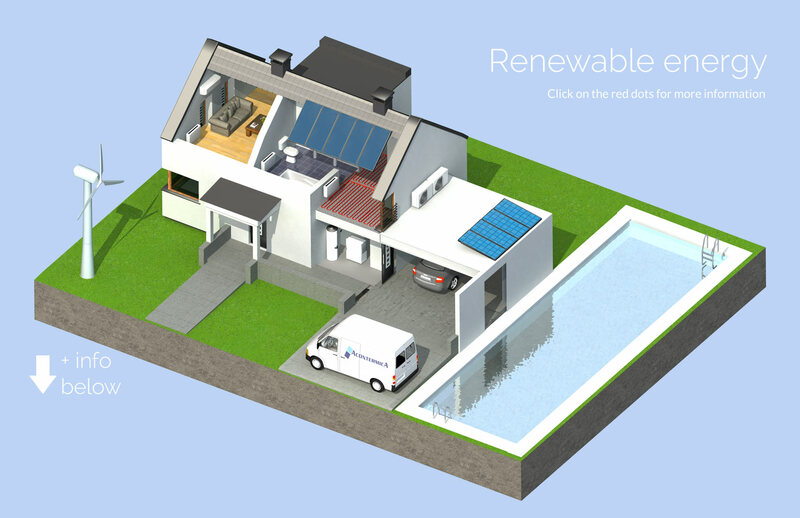 The most common use of solar energy in domestic installation is to create DHW (domestic hot water), hot water is created by placing a solar panel or collector exposed to the sun on terraces or roof tops, hot water is circulated and goes into a storage tank which is controlled by a small domestic installed unit which is then available for the user´s supply. We can also use this system for cooling, utilizing the absorption machines which can produce cold air conditioning. Furthermore it is possible to create electricity through a generator creating the network (solar thermal energy) utilizing the heat and mechanical motion or directly transforming the solar radiation into electricity with the photovoltaic cell power (in photovoltaic energy). It also goes perfectly with other aerothermic systems.